Defeat Dyslexia! 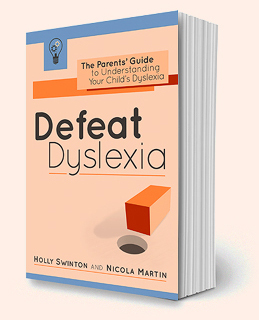 author Holly Swinton shares her story of growing up with dyslexia. When I was growing up, I never thought it was strange that I had to read a paragraph of writing ten times to understand the meaning. I thought everyone ‘cheated’ at their times tables, quickly adding on the next digit as they recited ‘two threes are six, three threes are nine …’ I assumed everyone had a brief moment of panic when they looked at their watch and tried to tell the time. Of course, I noticed that not everyone got lost constantly; not everyone was forgetful and disorganised; not everyone checked their work obsessively and wrote 20 drafts of an essay, the way I did. When I compared myself with other people in my class, I could see that there was a difference. I didn’t know the word ‘dyslexic’, though, so I used one that I did know: stupid. There was another voice in my head, though; one that told me, no, you really are clever. That voice belonged to my mum. The contradiction made me feel confused (how could I be clever when I made such stupid mistakes? ), but my mother’s faith in me meant that I never gave up. My mum always bolstered my self-esteem. This, combined with her willingness to work with me at home on times tables, handwriting, spelling, and more, was a big part of the reason I was able to excel at school and go on to university. I did so well academically (as a result of hard work and study strategies that I developed myself) that it never occurred to anyone that I might have a learning difficulty. Now, of course, I can think back to my childhood and the signs of dyslexia are obvious. Looking at written work from my school days, I notice the tell-tale signs of missing words, no punctuation, easy words misspelled. I now understand why there are so many rubbings-out and ‘silly’ mistakes in an otherwise-intelligent piece of work. ‘Funny’ stories from my early life take on new meaning now, as well. When I was in infants’ school, I was a great reader. I could read every page in the picture books – or so my teacher thought. Then, one day, the teacher accidentally turned over two pages instead of one. But, instead of reading the page in front of me, I recited what was written on the previous page. It turned out I couldn’t read, after all. I’d simply memorised the words to give the impression that I could. 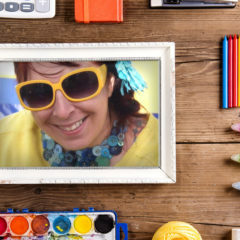 If dyslexia had been more widely understood at the time, someone might have connected the dots and realised that my struggles had their root in an incredibly common learning difference. However, it wasn’t until I was in my twenties that I was diagnosed. Do you think you might be dyslexic? I can’t quite articulate the reason I chose to go for that dyslexia screening. I didn’t know a lot about dyslexia, but I felt subtly pursued by this tricky little word. At an office job I’d held prior to university, I would often find myself making misspellings when I typed phrases into Google. For some reason, these misspellings meant that I was redirected to a web page that asked, Do you think you might be dyslexic? No. No one had ever told me I was dyslexic. But, nonetheless, I kept ending up on that web page. At university, I still didn’t think I was dyslexic. Nonetheless, I chose to take the university’s dyslexia screening – on a dusty old computer in the library – as soon as I was able. At the end of the screening, a message flashed up on the screen: Congratulations, you are dyslexic! The computer screening was quick, but getting the official diagnosis took much longer. I had to wait six months to be seen by an Educational Psychologist. Luckily, he was very nice, during what turned out to be a harrowing, humiliating day. Initially, I tried to fudge my way through the assessment. I guessed at answers. 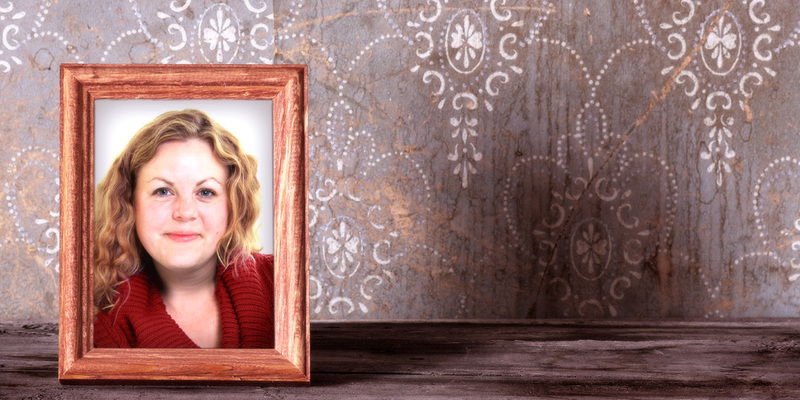 I put on my best performance as a confident, able reader – and then I burst into tears. I was utterly humiliated at having to reveal things about myself that I’d put so much effort into concealing. There was my weak working memory, which made it difficult for me to remember a chain of even three digits. There was my dismal reading comprehension, which required me to read and re-read a passage in order to understand it. All of these things were suddenly under a microscope – and I hated it. It’s little wonder that, after the assessment, I put the Educational Psychologist’s report on my dyslexia in a drawer without reading it. It’s a strange contradiction, because I can say wholeheartedly that my dyslexia diagnosis was a huge relief for me. (After all, ‘dyslexic’ was a much better label than the one I’d been using before: ‘stupid’.) And yet that report from the Educational Psychologist haunted me. In fact, I didn’t read it for more than ten years. It wasn’t until I started writing this book and my co-author asked to see the report that I finally pulled it out of the drawer. Even after so many years had passed – even after embarking on a successful career helping other dyslexics – reading about my own dyslexia was incredibly hard. I had to read the report in three sittings, taking long breaks to collect myself. I felt very alone. The dry, dispassionate language of the report made me feel inadequate. That was the problem when I was first diagnosed: I was given the label ‘dyslexic’, but no one ever really explained to me what it meant. The university gave me a laptop to help with my studies, but offered no guidance on dealing with dyslexia. My family, though they tried to be supportive, didn’t know anything about dyslexia. I had a few dyslexic friends, but they were just as clueless about the condition as I was. For a long time, dyslexia was a part of me, but one which I scarcely understood. I got through university and my postgraduate teacher training the same way I’d got through school: hard work and lots of it. While my non-dyslexic friends could afford to slack off sometimes, I never could: I worked all day, every day, in order to get my BA and PGCE (Postgraduate Certificate in Education). I spent my PGCE year on five hours of sleep a night, working harder and harder and harder to achieve my dream of becoming a teacher. Dyslexia might have remained an unexamined part of my identity if it weren’t for a girl named Chelsea, a friend’s daughter who I offered to tutor. Chelsea is bright but dyslexic, and I couldn’t help but see myself in her. I passed on to her the strategies for coping with dyslexia that I’d developed over the years, but I wanted to do more for her. So I set about learning everything I could about dyslexia. I read every book on dyslexia I could lay my hands on. I attended umpteen courses. I tried out myriad learning resources, computer programs, and different teaching approaches, in order to see what worked best. I set out to help Chelsea, but of course, I ended up helping myself as well. For the first time, I was able to understand why ‘I am the way I am’. All those idiosyncrasies of mine, all those weird little habits … I began to see their root was in my dyslexia. And I began to realise just how many children and adults there are around the world who are struggling with the same things as me. I wish that, when I’d been diagnosed, someone had sat me down and talked me through dyslexia. I wish I could hop in a time machine, and go back and see that humiliated version of myself who cried during her dyslexia assessment. No, I wish I could go back further. I’d go and see that little girl in infants’ school who simply pretended she could read. I’d tell her: You are not alone. You are not stupid. Your brain is wired differently, but by working smarter, in ways that suit you, you will be able to fly. I can’t time-travel, but I can communicate that message to dyslexics like me. It’s what has led me to specialise in tutoring dyslexic children. It’s the reason I’ve trained to become a dyslexia assessor. It’s why I organise free workshops for children, and support groups for parents of dyslexic children. And, of course, it has inspired me to write a book – the book I wish I’d been able to read all those years ago. Even today, I’m still a slow reader. I still need to obsessively check my work. I still have that brief, blank moment when I look at my watch and try to tell the time. I still mix up left and right when I’m stressed. But I can also see the incredible positives of dyslexia, too. Like many dyslexic people, I question everything and I’m a very creative problem solver, making new connections and coming up with innovative ideas. I also have great determination to overcome obstacles in my path. I’ve learned not to believe those who tell me I am not able to do things. Dyslexics are everywhere, in every walk of life. And I know that we can do anything we set our minds to.